A little over a year ago, when #lumbersexual was trending across all social media platforms, I couldn't resist taking a moment to point out and even poke fun of the fact that this new urban style wasn't really a new style at all -- but rather a way of life in communities throughout the Adirondacks. And while it was amusing to cross-reference the authentic Tupper Lake Lumberjack and the bearded Starbucks drinking hipster, I think it's time we step back to explore Tupper Lake's rich lumbering history and how it is celebrated today. Nearly 40 years prior to the incorporation of the Town of Tupper Lake (formerly known as the Town of Waverly, then as Altamont) the Pomeroy Lumber Company began the first logging operation of record on the shores of Big Tupper Lake and Raquette Pond. During their time here they harvested the virgin pines, leaving acres of clearing around Raquette Pond. 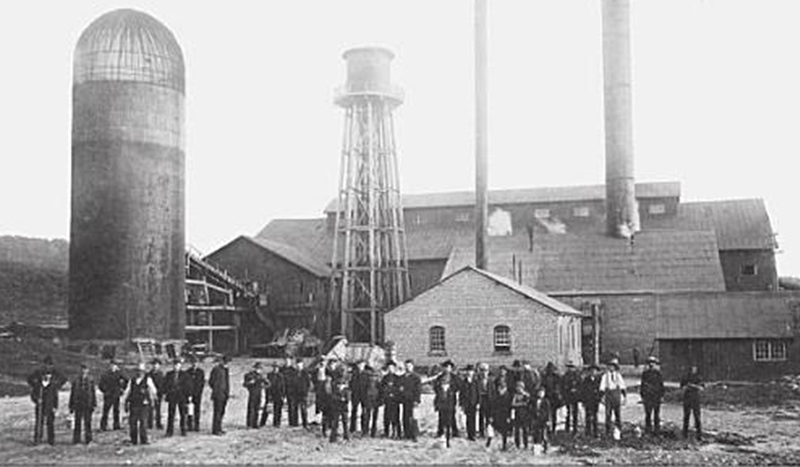 After the company pulled out to return to Maine, their foreman, William McLaughlin, stayed behind and sold off the cleared lots -- eventually leading to the town's formation in 1890. During this same timeframe came a rush of settlers and a wide range of different size logging operations, logging camps, and then sawmills. Soon dams were erected along the Raquette River, and Tupper Lake was feeding logs to mills as far away as Potsdam, NY. Some of the more notable operations included International Paper's mill in Piercefield and the Oval Wood Dish on Demars Boulevard in Tupper Lake (originally referred to as "Sissonville" after the Sisson Family of Potsdam - who first built the mill there). But the most famous was Hurd's Mill (also known as The Big Mill) which sat on the shore Raquette Pond, where the Tupper Lake Municipal Park is today. The Big Mill was most notable for having sawed over a million board feet of lumber in one day -- a world record at that time. For more than half a century, logging remained the primary industry in Tupper Lake. While the logging industry of the Adirondacks is no longer at the scale it once was, many of us who live here today still have some sort of tie to the logging industry -- either past or present. My grandfather was a lumberjack (and a bootlegger, but that's a different story), my great-aunt was a cook at lumber camps, my father worked in the woods for many years. I am sure there are many others that I probably don't even know about. I have many fond memories from my childhood, visiting Dad at the job site after school, climbing up into the skidder for a ride (which looking back was probably just a photo op). But of those memories, some of my favorites were every July, when the big equipment came out of the woods and right into town for the annual Tupper Lake Woodsmen's Days. As children of the 1980s we would practically camp out at the park all weekend watching our family and neighbors compete in different events. If we were lucky enough that one of them operated a shiny new truck or other piece of equipment, we might even get a chance to ride in the parade. It was a big deal! With a history dating back to the 1930s, The Tupper Lake Woodsmen's Days is still the signature heritage event for Tupper Lake. Always scheduled for the second weekend of July -- this year's event takes place July 8-10, and will once again consists of a plethora of activities including a parade, logging competitions, food and wood-product vending, games, activities for youngsters, and more. Located on the footprint of where Hurd's Big Mill once stood, the legacy of the Tupper Lake lumberjacks lives on each summer during the annual Woodsmen's Days. This year's schedule of events is still coming together, but the Tupper Lake Woodsmen's Association guarantees that we are going to have some favorites from the past as well as some new additions. Visitors can expect to once again enjoy the gala parade, ride in the monster trucks, watch fun competitions such as the woodsmen's loading and skidding competitions, chainsaw carving contest & auctions, 4-man team competition, and more. Then there are the exciting night games when locals and visitors alike form teams to compete in the Tug-of-War competition and climb the Greased Pole (yup, I said greased pole - all I can say is this is one you simply have to be here to experience). Don't miss the weekend of July 8-10! Whether it is tapping into local culture, learning more about the history of logging, getting the chance to let your children ride in a monster truck, finding that perfect wood carving for your home, camp, or office, or simply not standing out when you are sporting a beard and flannel, The Tupper Lake Woodsmen's Days is an event that offers a little something for everyone. So, don't let another year go by without checking out what all the buzz is about (and by buzz, I totally mean chainsaws)! Book a room today for the weekend of July 8-10 and come incorporate a little lumberjack fun into your summer getaway. Trust me, it's an experience to remember. ** Header Images courtesy of Jim Lanthier's Kathleen Bigrow Historic Collection. While we should not forget the past , we sometimes don't realize or present. Tupper Lake is still very much a "logging town". Contractors are fewer but larger than they were some time ago . Tupper Lake is also the home of the only sawmill within the Adirondack Park. We, as lumberman, take pride in the millions of board feet of lumber we produce in Tupper Lake for the past 23 years.